What's the weather looking like where you are? It's been raining pretty hard over here, so we've been stuck at indoors quite a bit. (But we don't mind at all because we desperately need the rain! Boo, drought.) Inspired by our rainy weather, today I'm sharing this fun and easy printable weather-themed board game with y'all. Just print it out, color it in, and play it with your kiddos! One of our favorite things to do is combine science with art. As much as we love doing art and craft projects, we also do quite a bit of science activities too! So here are some other fun ideas for doing weather-themed art ideas! 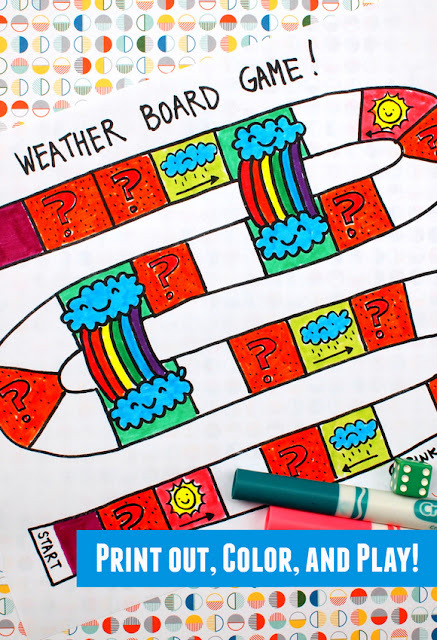 And click here to download your free copy of this Printable Weather Board Game! Today's post is part of a collaborative series! 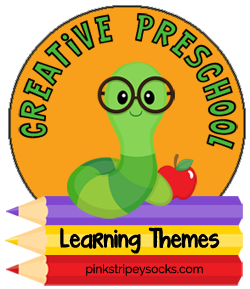 Here are 5 other preschool weather ideas from my favorite preschool craft bloggers! You can always find more fun ideas on my Pinterest, Facebook, or Instagram account!